The French painter Maurice Utrillo was born as the illegitimate son of the painter Suzanne Valladon in Paris on December 26, 1883. He was adopted by the Catalan art critic Miguel Utrillo y Molins in 1891. As a painter Maurice Utrillo is an autodidact, he learns the skills from his mother, who wants to keep him away from his addiction to alcohol. His first paintings are made around 1903, mostly views of Paris, street scenes, alleys and houses, views of Montmartre and the suburbs, pictures that have a certain poetic charm. His paintings up until 1907 are dominated by the colors yellow, turquoise, wine red and zinc white. From 1909 to 1914 he confines his palette to white and shades of gray. In order to attain a greater realistic effect with his paintings, Maurice Utrillo mixes sand and gypsum into the paint. This so-called “Periode blanche” (White Period) marks the highlight of Utrillo’s creation. In 1912 he participates in the Salon d’Automne. As of 1914 his paintings become less and less colorful. He also makes numerous still lifes, mostly of flowers that he accentuates with dabs of shiny colors. People in his paintings appear as beings that are lonely and isolated from society. The Galérie Bernheim-Jeune sets up an exhibition with works by Utrillo and his mother Suzanne Valladon in 1923. A year later he tries to commit suicide, but fortunately fails. In 1935 he marries Lucie Pauwels, widow of a Belgian collector. She begins to paint under the pseudonym Lucie Valore, mostly making portraits, landscapes and still lifes. The artist is honored with a large retrospective in the Salon d’Automne in 1943. 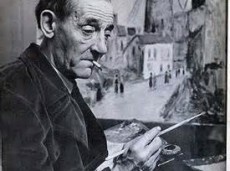 Maurice Utrillo dies in the Southern French town of Dax on November 11, 1955.